More than 15 million people in England are estimated to be living with a long-term condition such as diabetes, asthma, depression, MS or cardiovascular disease. While you may be skilled at helping your patients manage their conditions, being a nurse does not give you immunity from becoming ill yourself. Here we look at continuing to nurse after being diagnosed with a long-term condition. The advice you give your patients also applies to you. It is important to allow yourself time to accept your diagnosis and what it means. Expect to feel a range of emotions such as anger, despair or hopelessness, which are entirely normal. Despite thinking that no one really understands, try not to bottle up your feelings. The insight gained by becoming ill yourself will enhance your ability to empathise with your patients, but this should not be at the expense of your own long-term well-being. Maintaining your health involves being proactive, acknowledging your physical symptoms and adjusting your lifestyle. Part of this process is exploring how your career may be affected – your current role as well as your plans for the future. 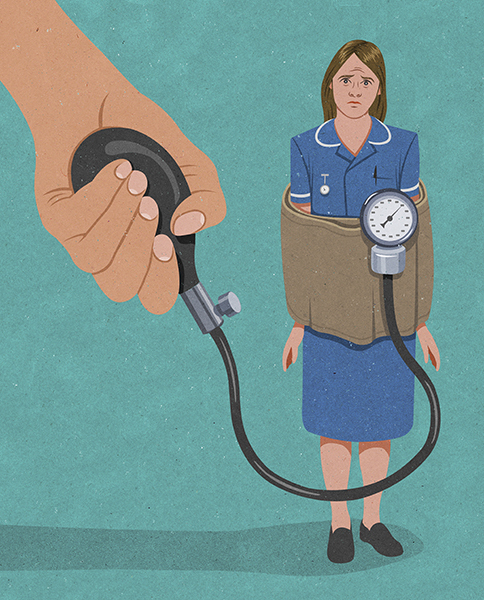 Ward nursing can be challenging, so you will have to weigh up how you balance the physical and emotional demands of your role with managing your own symptoms. Remember, too, that nurses work in a range of settings, so there are other options available. If possible, take time to think things through and be honest with yourself about what you want and need, and do not make any hasty decisions. Consider discussing your work situation with an expert. This could be your GP, a medical specialist, an occupational health department or an adviser from a relevant charity. You know best what impact your condition is having and how your needs fluctuate. To help you feel you are in control, be as open and honest as you can with your employer or line manager. As this might be a hard conversation to initiate, take time to think through what you want to say and what you need from your employer. Consider having someone with you for support who can write down key points. Try to speak calmly and stick to the facts. Do not feel embarrassed about expressing your needs – your employer will weigh up what is in the best interests of both you and your patients. If your condition is covered by the Equality Act 2010 there is a legal duty for your employer to make reasonable adjustments so you can continue in your role, such as changing shift patterns or providing extra equipment. Once you have an initial plan in place to support you at work, remember to review it regularly. Your health needs may change, or you may decide that you want to move away from the clinical setting. Keep asking yourself what you need, and maintain open communication with your employer. Try to be as compassionate to yourself as you are with your patients.